It's been a year since I turned an Entrepreneur. 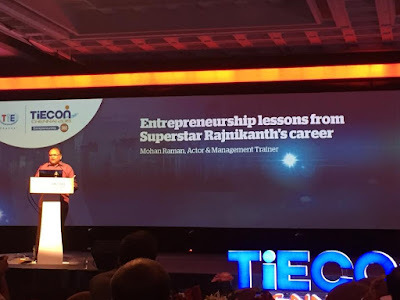 Ever since, I have been a member of TiE - The Indus Entrepreneurs, Chennai which is a group of current and future Entrepreneurs. The syndicate is professionally managed by a team of able people and has successful Entrepreneurs as Members, Charter Members and various other roles. TiE conducts atleast 3-4 events every month which is open to all members and non-members can join by paying a small fee. In the one year that I've been a member, I have benifited immensely by getting to know some very interesting and knowledgable people, some who have even turned out to be my business beneficiaries. TieCon is an annual event held by the Syndicate which aims to bring together Entrepreneurs of various walks of life. The current year's edition was held on Saturday, 31st Oct. 2015 which was preceded by an Awards Night were a few Entrepreneurs were recognised and honored for their contribution to the ecosystem. The event was held at The Grand Chola, one of the marquee locations in Chennai and is probably one of the biggest of its kind in the country. The day started from 8am onwards, with bring entry of participants and a quick introduction and networking. The official proceedings commenced with a Drum show (yeah, Jus Drums! was the name of the team that performed) which woke not just the senses but also set a great day in motion. There were addresses by the Distinguished charter Member, Mr. Lakshmi Narayanan, Vice chairman of Cognizant Technologies, which is among the top 5 IT services companies of India, Current President of TiE Chennai, Mr. Naru Narayanan and Event Chair, Ms. Padma Chandrasekaran. The day started with a session by Mr. Mahesh Murthy, an angel Investor who has more than 50 companies in his portfolio which was followed with a key note address by Mr. Ronnie Screwala, Founder and CEO of UTv Pictures, a first generation Entrepreneur who was also the first in the country to operate a private Cable Tv Network way back in the 90s. He spoke about his journey, the struggles, the good ones and the not so good ones and the various aspects and facets of Entrepreneurship. Mr. Girish Mathrubootham, Founder of Chennai based Freshdesk, a SaaS company that provides tools for customer Service and Support to more than 50,000 clients all over the world was awared Big Billion Baby which included a fireside chat with the man himself, ably conducted by Mr. Chandu Nair, another serial entrepreneur and charter member of Tie Chennai. Girish spoke about his inspiring journey, hailing from erstwhile small town Trichy, having worked with some of the largest companies earlier which provided the same service, his first fund raise, the ups and downs and finally about the recent $50 million funding received by the company. An extremely humble and down to earth guy, he spoke about how Entrepreneurs have to sacrifice quite a bit of their family life and family time. Incidentally, the day marked his Wedding Anniversary too. After this session, there was various Masterclasses, Mentoring sessions, Luncheon meetings and so on which was well attended enthusiastically by budding Entrepreneurs. 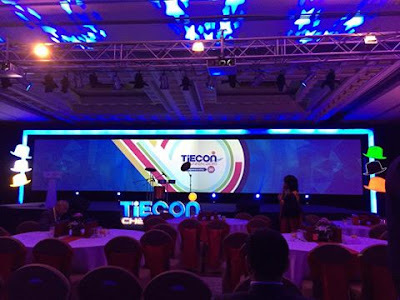 I couldn't attend any of these sessions, for my latest and upcoming Hyperlocal Ecommerce Venture Oyethere.com was among the Top 20 Finalists for the Pitchfest which is a highlight of Tiecon. We were selected among 100s of applications that were submitted over the past few months and it was an honour and privilege to meet potential Investors and to have a one on one discussion with them. I had the opportunity to pitch to 8 Investors, and the feedback for the venture from each one of them was overwhelming. The Investors acknowledged the hotness of this category and wished me luck for the future. Some of them have said that we could meet in the coming days to discuss further. Will know the course of action and next steps in the coming days. After the Pitchfest was over, I joined back the main session which had an interesting standup Comedy session by Arvind Subramaniam of the popular theatre group Evam. The valedictory session was led by Mr. Raju Venkatraman, Serial Entrepreneur and Founder of Medall, a Chennai based Healthcare Company. The final session of the day was on Leadership Lessons from Actor Rajnikanth, presented by Mr. Mohanram, Theatre personality, Actor, Trainer and Entrepreneur. The day ended at 6pm with a lot of learning to more than 1,500 people who had gathered for the event. I, for one was double delighted with the recognition that my venture was given as well as meeting and hearing snippets from Entrepreneur stalwarts.